I've been in abit of a reading rut lately, but this little story definitely broke through it. I immediately liked Sparrow and all her quirks. It's easy to see her as rude or disrespectful until you kind of think of yourself when you were in eighth grade. Sparrow is shy to the point that it's crippling for her. She hasn't had a real, true friend since kindergarten, unless you count Mrs. Wexler. Sparrow also has a secret that no one knows about. The inner girl desperately wants to be a bird. 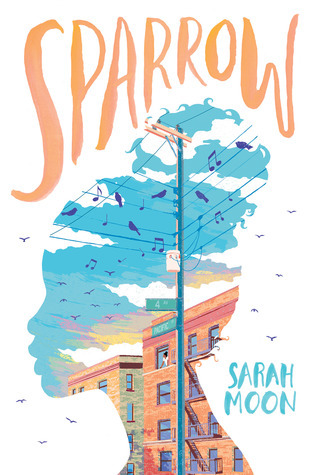 I know that sounds crazy, but Moon does a great job writing Sparrow's inner workings and it makes you feel like you're right there with her. You get to see how Sparrow changes through her therapy sessions, the music she falls in love with, and her relationship with her mother. It's heartbreaking and hopeful at the same time. I loved Sparrow's sessions with Dr. Katz. They are funny and real. Her interactions with her mother hurt as does every conversation she has with other humans. It's nice to see strong, supportive parents, doctors, and teachers, too. I loved Sparrow's story. Watching her come back to life between the pages was heartwarming. I hope I stay out of this slump.